Habit: Annual. Stem: 1--many from base, 0.3--1(2) m, proximally decumbent and arching upward or erect, glabrous or proximally bristly. 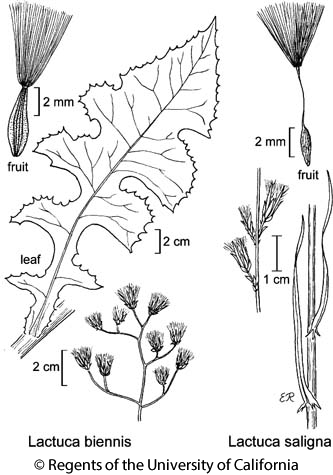 Leaf: basal generally 0 at flower, cauline few to many, linear to lanceolate, entire or with few, linear lobes, base sagittate or hastate, clasping; abaxial midvein glabrous or prickly-bristly. Inflorescence: heads few to many in generally narrow, spike-like or panicle-like clusters; branches and peduncles often appressed; open heads 4--5 mm diam; involucre in fruit 10--17 mm. Flower: 5--12; corolla pale yellow. Fruit: body 2.5--3.5 mm, brown, dark-mottled, rough, glabrous, unwinged, faces 5--7-ribbed; beak thread-like, 5--6 mm; pappus 5--6 mm, white. Chromosomes: 2n=18. Citation for this treatment: David J. Keil & G. Ledyard Stebbins 2012, Lactuca saligna, in Jepson Flora Project (eds.) Jepson eFlora, http://ucjeps.berkeley.edu/eflora/eflora_display.php?tid=3688, accessed on April 22, 2019. KR, NCoR, n SNF, ScV, CW, SW; Markers link to CCH specimen records. Yellow markers indicate records that may provide evidence for eFlora range revision or may have georeferencing or identification issues. Purple markers indicate specimens collected from a garden, greenhouse, or other non-wild location.